The Water Key recognizes the need for a convenient and affordable way to find out how safe your drinking water is. 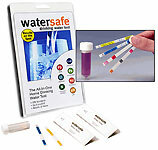 The Watersafe All-In-One Test Kit is a simple, do-it-yourself test kit that gives professional lab-quality results for (Bacteria, Lead, Pesticides, Nitrates, Nitrites, Chlorine, pH and Hardness) 8 of the most common and potentially hazardous contaminants found in drinking water. Sample your water today and watch results appear right before your eyes! For your family’s health, you'll be glad you did.